Freshman social work major Ty Johnson smiled slightly as he perfected the dramatic blue makeup lining his eyes, matching the dress he would later wear to open the University of Indianapolis’ 13th annual Drag Show. It was also the dress Johnson would wear when he, as his drag alter ego Fruit Tea, was awarded the title of best queen. Johnson did drag in high school, he said, and attended the drag show at UIndy last year. The thrill of performing in front of a larger audience during his first year of college, he said, both excited him and made him nervous. 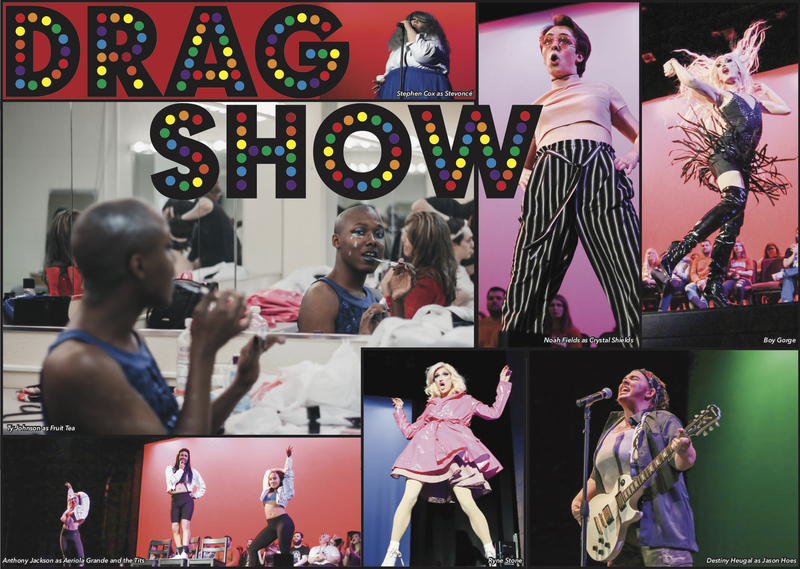 For more than a decade, the Drag Show has been one of the most popular events on UIndy’s campus. 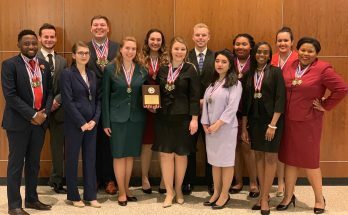 Proceeds from the event, which are often donations in the form of dollar bills thrown on the stage by a cheering crowd or collected by cigarette girls and boys, go towards Indiana Youth Group, a nonprofit organization dedicated to Hoosier LGBTQ youth. Although entry to the event has been free of charge in the past, admission for this year’s show cost $1 to raise additional funds for IYG. Junior theatre Destiny Huegal said this year’s Drag Show raised more money off of admissions than they have in previous years, with this year’s show raising $1,503. The Drag Show, which is organized by UIndy PRIDE and Alpha Psi Omega, has also helped increase awareness of the prominent LGBTQ presence on campus and encourages inclusion, according to OJ Moor, who co-chairs UIndy PRIDE alongside Emily Larmore. Sophomore theatre major Clayton Rardon and Huegel served as co-hosts of the show for the first time. Although this is not their first time being in the show. They participated various in bits of the show last year, when then-host Stephen Cox pretended to show them the ropes of hosting the show after his graduation. For Huegel, her first impression of the drag show was of surprise. She said that she did not expect the diversity of the crowd that showed up in droves to enjoy the entertainment and support the campus’ LGBTQ community. Rardon and Huegel also performed a duet together in the drag show last year, but for Rardon, his connection to the event goes back to before he was a UIndy student. He attended it for the first time while he was still in high school and was visiting campus for the Campus Campout. Because of the university’s Methodist affiliation, Rardon said, it surprised him to see that a drag show would be taking place on campus during his time there. 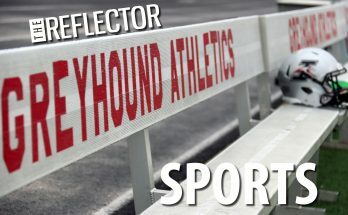 It was a feeling that was only reaffirmed when he took to the stage for the first time last year, according to Rardon. He said that a recent memory appeared on his social media, from the 2018 drag show, and it reminded him of why the event is special to him. There is still a good-natured competition involved where contestants are judged based on various aspects of their performance. The night’s judging panel consisted of: Professional Edge’s Assistant Director of Arts, Non-Profit, & Communication in the Center D’ana Downing, Associate Professor of Teacher Education Terrence Harewood, Assistant Professor of Communication Stephanie Wideman and high school student Max Gallagher, whose mother is Administrative Assistant of Student Affairs Cari Gallagher. No matter what titles are awarded at the conclusion of the night, however, every performer is greeted by the thunderous cheers of the audience and their performances end with similar enthusiasm. 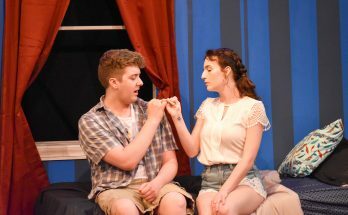 Students, alumni, drag queens from other universities and even professionals perform under the multicolored stage lights of Ransburg Auditorium each spring on a volunteer basis, and some have even earned the loyalty of small fan followings. Junior human resource major Megan Moranz has attended the drag show annually since she first arrived at UIndy three years ago. There are recurring performers she looks forward to seeing, Moranz said, and she wants the LGBTQ community on campus to know they are included.